These are, by and far, people that truly appreciate high performance. These are skiers and snowboarders that are highly knowledgeable about the importance of regular maintenance and tuning (and oftentimes, know full well how to do it themselves). These are smart, inquisitive, and articulate people. These are people that understand what "structure", "beveling", and "overlays" are, and how they work (or don't work). And, they enjoy riding the very best that money can buy. In this regard, we might consider the "average" Hertel customer a pretty typical "tech nerd". Truth is, there's another side to all of this. Once you get them out of the tuning room, and onto the mountain, you'll find that the "average" Hertel customer isn't quite your "average" snowboarder or skier, either. The average Hertel customer is the guy (or gal) that's up at 4 am, hiking into the backcountry, and getting their first drop on a fresh powder day before most "average" skiers and boarders have even had their first cup of coffee. These are people that are out hiking the terrain park in the driving rain, just to get those last hits in before the season ends. These are people that live to out-run the Ski Patrol at every available opportunity (until Ski Patrol gets their hands on some Hertel of their own, and evens up those odds... at which point, all bets are off). These are people that are passionate about what they do, and are dedicated to the art of having fun. And they don't mind breaking "the rules", or stirring up a little bit of trouble along the way. They're the black sheep, the rogues, and the badasses. But they're also some of the most capable, most competent, most experienced, and the most knowledgeable skiers and snowboarders on the entire mountain. This puts them right up there with "the best". What we have here, is basically a smart and savvy group of outlaws. In a word, "pirates". This was our first concept for a "Team Hertel". Definitely "cool enough". But still, not really what we had in mind. This graphic did make it to the fronts of the "Team" shirts, though. Just so everybody knows exactly who you are, and what you represent, from every possible angle. Stand tall, y'all. This realization was the starting point of The Jolly Roger Project. Part "community outreach", part "research and development team", part "promotional and sales force", part "ski and snowboard club", and part "customer rewards"... 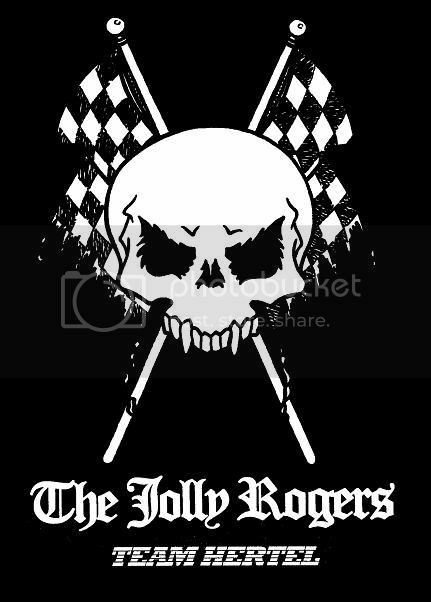 The Jolly Rogers takes the old idea of what a "factory team" should be, and brings it fast-forward into a 2012 world. Now, this is more like it...! This is the back-graphic of the "Team" tees. So, so boss. In the past few weeks, there's been an intense interest in who The Jolly Rogers are, and what we're doing. Lots of people have signed up to be a part of the winning program. Before we start getting overwhelmed with requests, we wanted to point out that being a Jolly Roger is a pretty big responsibility. But, it's a responsibility that also comes with some pretty cool rewards. Let's start with the "average" ski and snowboard team. These are basically people that get free gear, to ultimately do very little for their community. They essentially "promote a brand on the mountain", and that's about it. Which is cool, if you're the "average" company, with "average" customers, that wants to build an "average" team. Hertel, though, is none of these things. 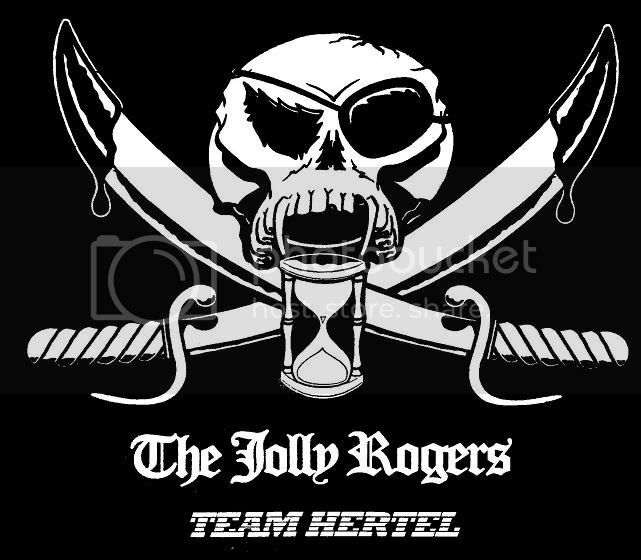 We have several shirt designs for The Jolly Rogers. All badass, all distinctive, and all slightly different from each other. We'll probably use them all eventually, just to change things up from year to year. The first and foremost goal of The Jolly Rogers, is to do "community outreach". These are the people that will put themselves out there, to make the world of skiing and snowboarding a better place for everybody. We're the guys and gals that will lend a hand to a newbie, and show them the ropes of making it down the mountain in one piece. We're the guys that will happily offer you a snack from our tailgating stash of cheeseburgers, brats, and pork chops in the parking lot. We're the ones that'll thank a Ski Patroller for their years of dedication and hard work, and give them a block of Racing FC739 as a "token of appreciation" present. We're the ones that'll give good gear advice to people that are doing the shopping, but not quite sure what they're looking for. It's all about spreading good vibes, sharing the know-how, giving back to the community that gave us so much, and promoting "the way it should be". Specifically, The Jolly Rogers are also huge proponents of wax use, in general. We know that something like 95% of the ski and snowboard universe just doesn't bother to wax their gear, and that's a travesty. Getting these people onto a wax- any wax- is a great start. Many of us will spend hours waxing people's gear in the parking lot, just to get them onto something that'll make their day more fun, more enjoyable, safer, and easier. It's just another way that we give back to the community around us. As we mentioned earlier, The Jolly Rogers also help with the research and development of new products. One of the best perks that I've ever had as a Roger, was getting my first blocks of the "experimental", reformulated Racing FC739 in the mail last season, with a note from Terry that simply said, "Hey, try this!". For two solid months, I simply out-ran and out-shredded everything that my home resort could throw at me. And that's a great, great feeling. Being part of a group of people that are collectively responsible for fine-tuning a brand-new product is an experience beyond comparison. Being part of the Racing FC739 Project was definitely the high point for most of The Rogers through the 2010/2011 season. Lots of good times, and good memories were had by everyone that took part. There's a lot to be said for knowing that you have the best-performing wax on the mountain on any given day, and this stuff sets the benchmark. You just can't put a price on that kind of confidence. 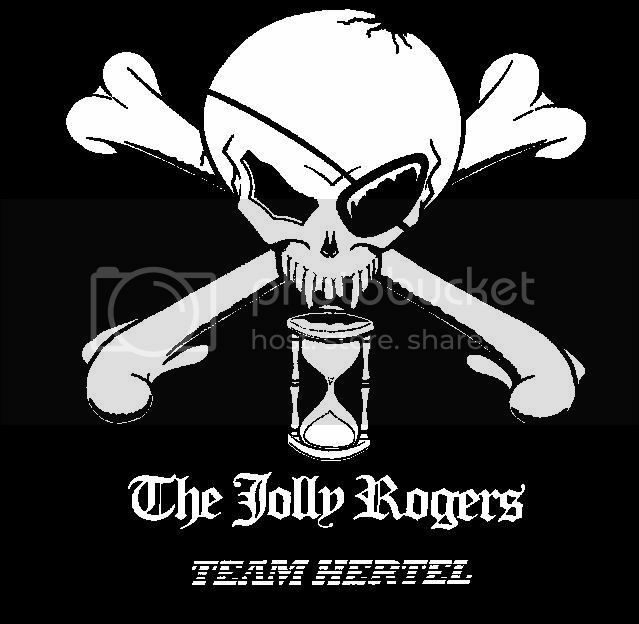 Members of The Jolly Rogers also get the added perk of having their own "members" password for the Hertel website. 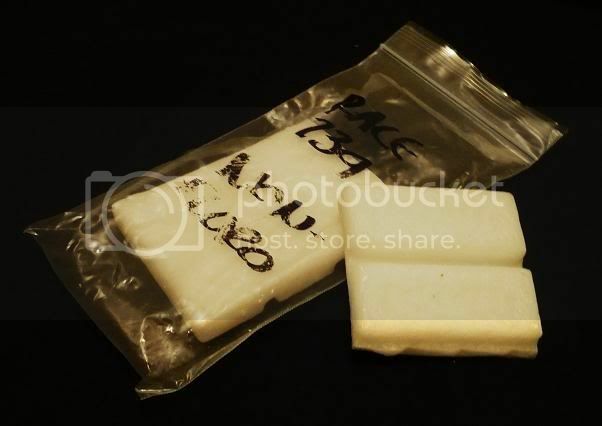 Which essentially allows them to buy all the wax they want, at wholesale prices. 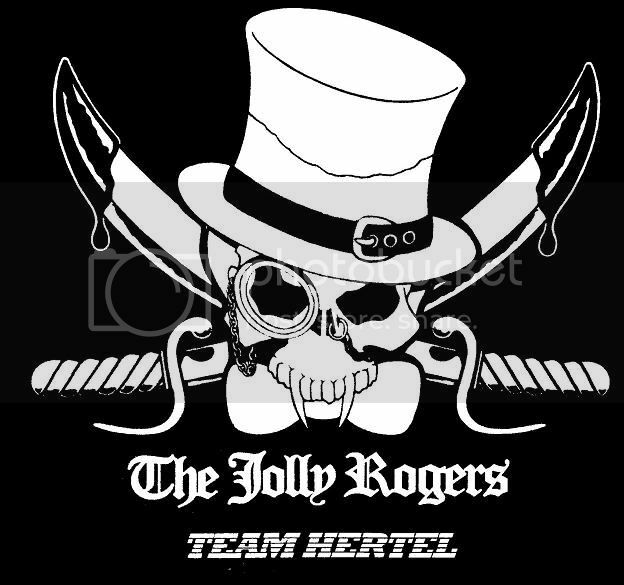 This allows many of The Jolly Rogers to become independent Hertel dealers. 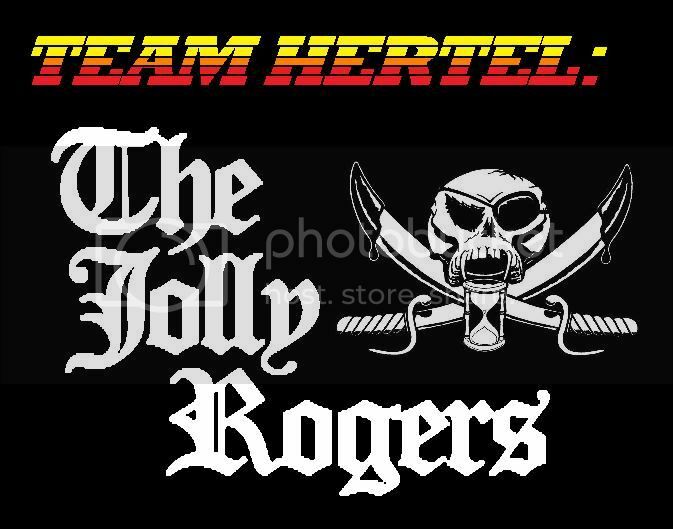 The truth is, several of The Jolly Rogers are long-time Hertel supporters and loyalists that have been spreading the word for many, many years anyway. This program allows them to profit a bit off of their hard work and promotional skills. Some re-sell their wax stockpiles at retail, which makes them a dandy profit, while others have gone on to become outside sales reps that sell Hertel waxes to their local ski and snowboard shops on a commission basis. Either way, they're spreading the good word about Hertel, and making a few bucks from their efforts. We even developed a "racer-specific" logo, for all you racers out there. Let the competition know right away that there's just no competing with the best. Then there's the "club t-shirts". Which are totally badass, super cheap, and even available in big and tall sizes to boot. There's been a lot of interest in making these available to the general public of Hertel loyalists, on a limited basis. We might just have to do that. We do, after all, consider all Hertel customers "part of the crew". Just by being Hertel customers, they've already taken that step that makes them legit. Being a Jolly Roger means being part of a select club of like-minded skiers, snowboarders, and Hertel enthusiasts. Any time you see somebody rocking The Jolly Roger skull-and-crossbones on the mountain, you'll know that person is "one of us". Somebody that shares the same values, passions, and outlook on what it truly means to be a snowboarder or a skier. Somebody that'll buy you a cold one in the lodge, share a tuning tip, toss you a smoked sausage, or barge that next chair to some secret, hidden run somewhere. It's becoming a very effective network, and a great way of making new friends in faraway places. Being a Jolly Roger is good work, and fun times. If you want to get on board, send an e-mail our way. It may take us a few weeks to wade through all of the responses, but trust us: we will get back to you.